The RoboBlast and its accessories have been developed with the intention of manufacturing an automated cleaning system which both meets the requirements of industrial companies for a continuous cleaning process, and minimizes consequential costs of machine / plant cleaning and maintenance. 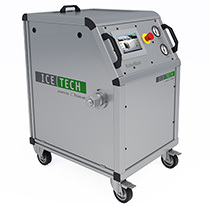 The RoboBlast enables dry ice blasting equipment to be connected to an automatic, robotic system that can be integrated within a production line. This automated cleaning system enables a dry ice blasting unit to be connected to automatic robot systems to ensure a perfect, uniformed clean every time. The RoboBlast is equipped with a number of process monitoring functions that ensure the dry ice blasting process works perfectly.